Betta fish has become one of the most popular fishes bred by human beings. They are popular mostly because for one, they are amazing fish to have and two, they come in a variety of colors hence making your aquarium quite beautiful to look at. •	Make sure you give your fish adequate space to move around. The common misconception is that a Betta fish can do well in a small vase or bowl. This is not the case as it requires more space so that it can be more active which in the long run increases its life span. •	Subtle lighting is good for Betta fish. Too much light may be harmful and not conducive to the fish. •	Make sure the pH for the water is approximately 6.4 to 7. Although these fish can do well in hard water, try to soften the water a bit so that they may thrive. Betta fish do well in temperatures of about 76 to 80 degrees Fahrenheit so make sure that you have an adequate thermometer to keep the temperature in check and also a water heater to warm the water during cold days. •	You can condition the water by adding almond leaves that produce a lot of natural acids which are beneficial to the fish. •	Use live aquatic plants mostly the floating plants. These floating plants help them to build bubble nests necessary for their breathing. These plants also offer shade to the fish and reduce the general toxicity of the water making the fish to enjoy a very conducive environment. •	Make sure you do regular water changes so as to reduce the toxicity levels due to the build-up of nitrates. 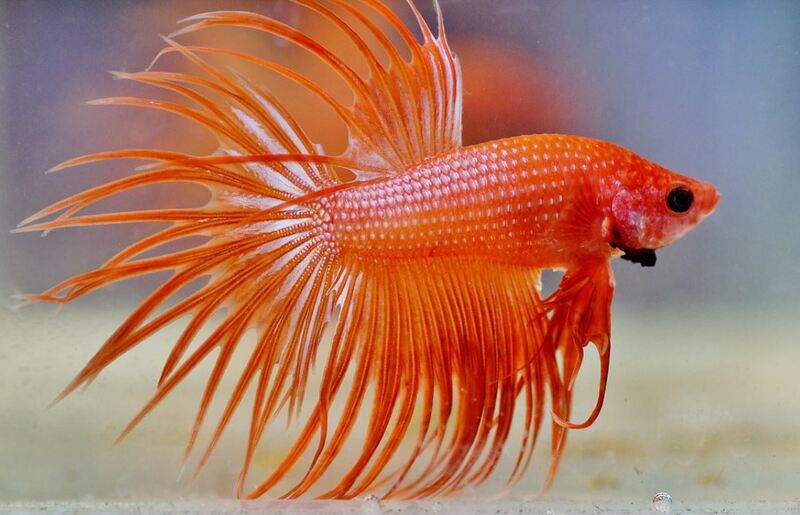 •	Make sure also to feed to Betta fish with the correct amount of food that will help in its growth. Betta fish can eat a wide variety of food for example bloodworms, frozen marine foods, white worms, and even pellets. Two small feeds in a day are recommended. Make sure you do not overfeed the fish as wasted food accumulates at the bottom making the tank dirty and also increases the toxicity levels by producing nitrates. This is not healthy for your fish and thus should be handled with care. •	Last but not least, give your fish love, look for any signs of diseases and treat them before they become worse. Loving your fish will surely make it have a longer lifespan.